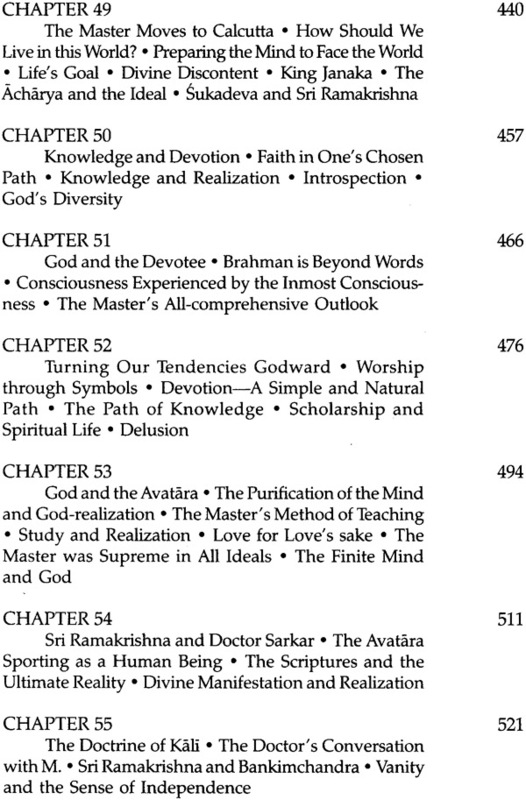 The uniqueness of Sri Ramakrishna kies not only in the practised various spiritual but also in that he realized God through each path. From his own experience he could proclaim, 'As many faiths, so many paths.' Men and women of all classes came to him irresistibly drawn by the power of his words-a power drawn from his extraordinary realizations and which penetrated to the very depths of their being Though he used simple words and lively stories, his conversations were profound. Fortunately, many of these wonder ful conversations were recorded with almost stenographic accuracy by one his disciples, and they were later published in Bengali under the title Sri Sri Ramakrishna Kathamrita and in English as The Gospel of Sri Ramakrishna. 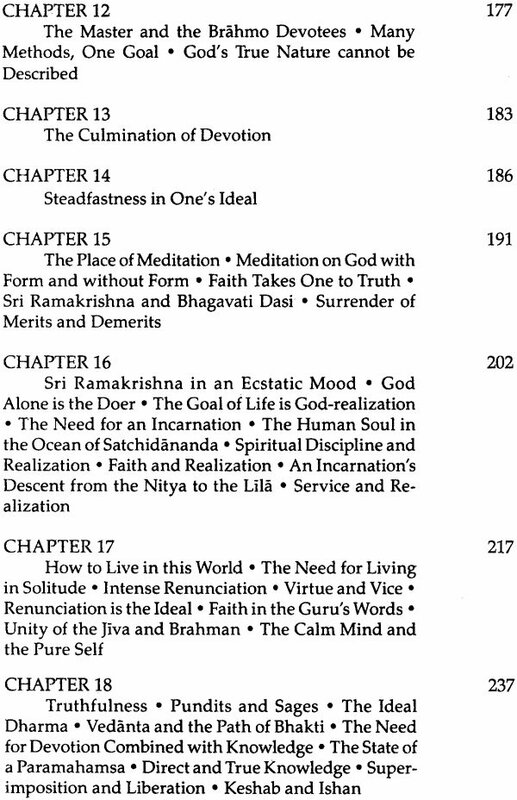 The present works is based on the weekly discourses given by Swami Bhuteshananda on the Sri Sri Ramakrishna Kathamrita. During his illuminating discussions, the Swami consistently went to the heart of the Master's words and uncovered the deeper meaning behind his simple utterances. 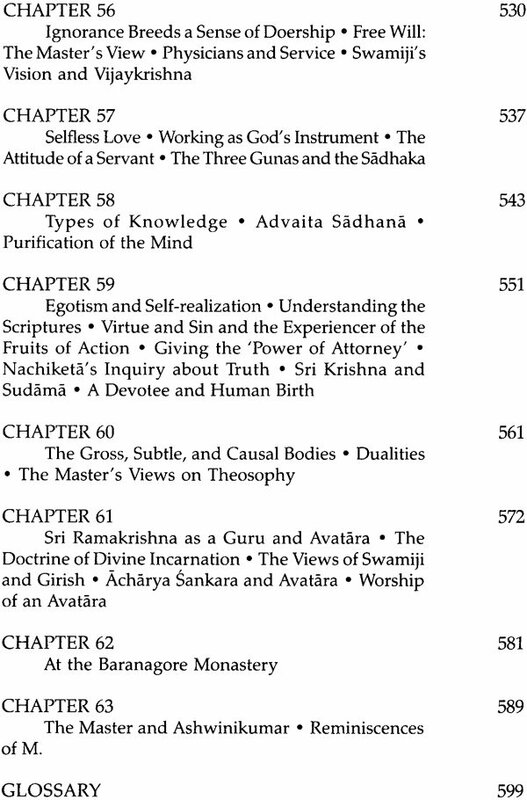 With the Swami's guidance given in the volume we are able to comprehend more easily Sri Ramakrishna's sayings in the light of the ancient scriptures as well as modern thought. Once, while explaining the significance of his Master's life Swami Vivekananda said: 'The life of Sri Ramakrishna was an extraordinary search light, under whose illumination one is able to really understand the whole scope of the Hindu religion. He showed by his life what the rishis and avataras really wanted to teach. The books were theories, he was the realization. This man had in fifty-one years lived the five thousand years of national spiritual life, and so raised himself to be an object-lesson for future generations. 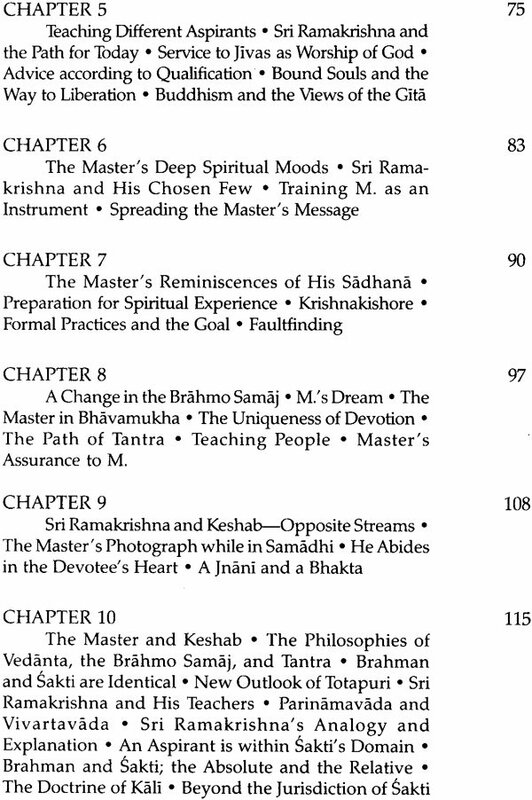 Through the boundless grace of the supremely compas sionate Sri Ramakrishna, Sri Sri Ramakrishna Kathamra Prasanga is being published in book form. 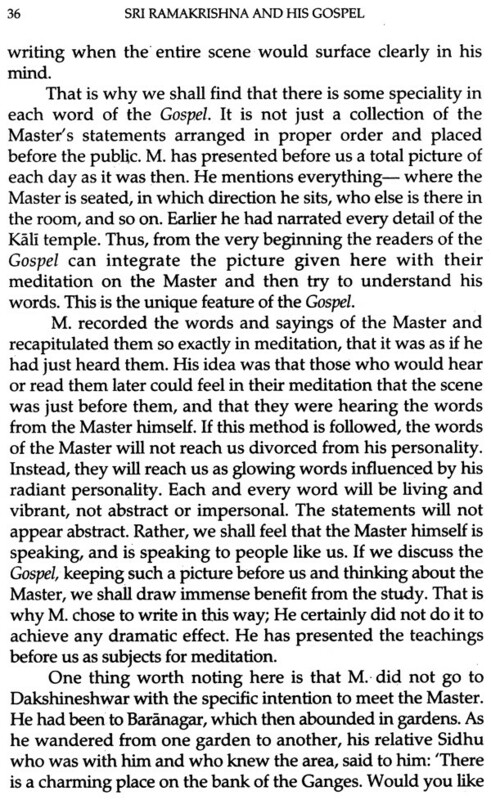 Some of the devotees, of their own accord, used to record the discussion on the Sri Sri Ramakrishna Kathamrita (The Gospel of Sri Ramakrishna), which were given at the weekly religious classes held first at Belur Math, and thereafter at the Ramakrishna Yogodyana Math. Later, these recordings were transcribed. Initially, Sri Samir Kumar Roy took upon himself this task and faithfully carried it out for a long time. Not only when he lived near Belur Math, but even after shifting his residence to Calcutta, he carried on this work with equal zeal, not withstanding the difficulties which presented themselves due to the change of his residence. Only when he had to leave Calcutta permanently was he forced to relinquish this work. In the meantime, however, inspired by his exemplary initiative, some other devotees who were regular participants of the weekly classes took this task upon themselves. 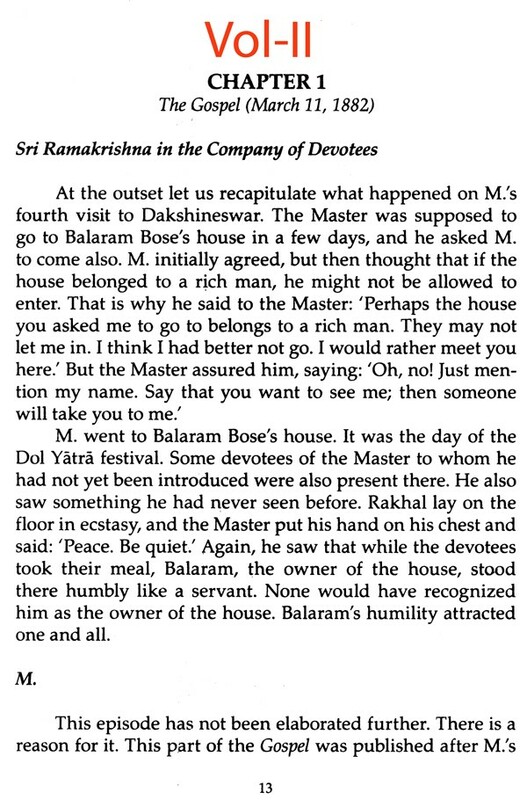 Thus the discussions on the Sri Sri Ramakrishna Kathamrita were preserved uninterruptedly. Many of the devotees desired that these discussions be printed in the form of a book. For this purpose, Prof. (Mrs.)Basanti Mukhopadhyaya and Mr. Arun Kumar Mitra rewrotethe manuscripts and made them suitable for publication. Swami Niramayananda, president of the Ramakrishna Math, Mumbai. corrected the manuscripts. and the Udbodhan Office took the responsibility for publishing it. The printing of the book was speedily completed due to the enthusiasm of Sri Arun Chandra Majumdar, proprietor of Mls Ava Press. Sri Dvijendranath Basu, Head of the Linguistics department, Calcutta University, greatly helped in the work of proof- reading. But for the combined efforts and co-operation of these persons and organizations, the book could not have been published in such a short time. Doubtless, many mistakes are still present in the book due to our inadvertance for which we are sorry. As the discussions were held at weekly intervals, some topics might have been left out; again, others may have been repeated at places. It has not been possible to avoid these repetitions, and we pray that we may be excused for this error. In spite of its imperfections, the book, even without being thoroughly corrected, is being published due to the earnest request of the devotees. It is hoped that the readers will overlook the mistakes and concentrate on the holy topics which form the subject of discussion in this book. 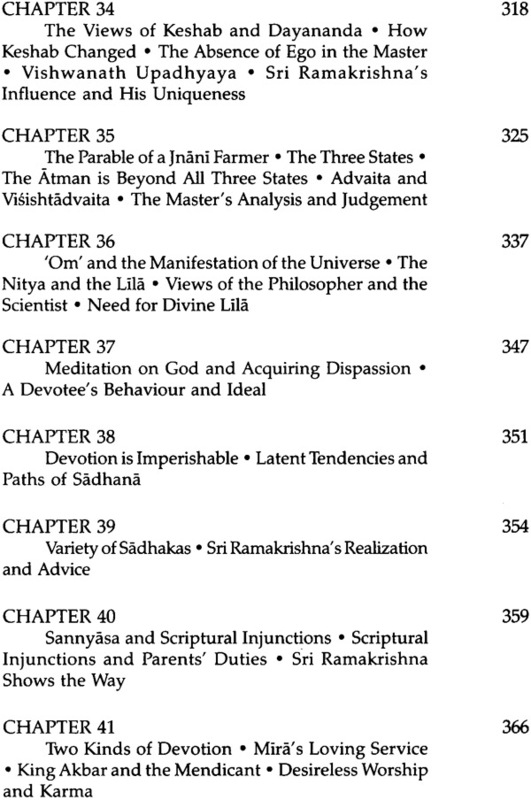 If these discussions can help the reader appreciate the beauty and charm of the Sri Sri Ramakrishna Kathamrita in the least, the author will consider his service to be fruitful. The devotees of Sri Ramakrishna firmly believe that The Gospel of Sri Ramakrishna contains the essence of all the scriptures. Besides, we do not know of any other work in which spiritual truths have been explained in such a simple manner as in this book, so as to be easily understood by everyone. So, there is no doubt that it is extremely beneficial for everyone to study and assimilate the teachings of the Gospel. In the Gospel one may find that the same thing is repeated in different places. Far from being imperfections, these repetitions are extremely beneficial. Our scriptures are considered eternal. As Sri Krishna says in the Gita: 'That ancient Yoga itself has been taught to you by me today." What was said in ancient times repeatedly was restated by Him to Arjuna in the Gita. God appears age after age and declares the same eternal truths of religion. Repeated incarnations of God and His repetition of the same eternal truths does not suffer from redundancy. The scriptures never tire in putting across the same message again and again. This is because our minds are such that even after hearing something time and again, it is doubtful if anything is registered at all. That is why the scriptures unceasingly repeat it. It is like a mother instructing her child repeatedly for its benefit. She does not get irritated repeating something again and again, for her only concern is the welfare of her child. In the same way, the scriptures repeat things in various ways. We come across the same pattern in the Gospel. Sri Ramakrishna's nephew, Hriday, asked him once: 'Well, uncle, why do you say the same thing time and again?' 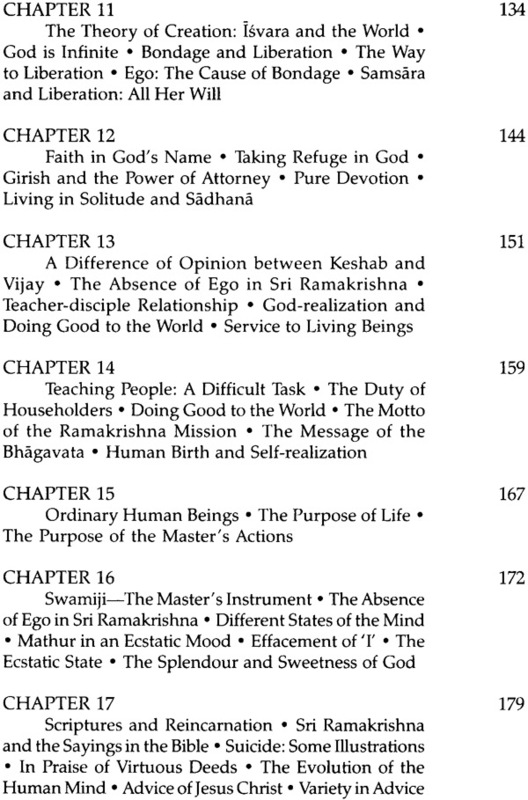 Sri Ramakrishna replied: 'Why should I not?' The idea is that if the same advice is not repeated time and again how can it make an impression on distracted minds like ours? That is why the scriptures must repeat things, and we should hear them repeatedly. Hence the sastras never suffer from redundancy. It is said in the Bhagavata that the sages stated on one occasion that the words of God are 'Sweet, sweet at every stage,.2 The more we hear them the more we gain renewed strength, as it were, thus enabling us to taste their essence with greater vigour. As days pass by and as we hear these words more and more, our understanding grows deeper, and we absorb their sweetness in greater measure. It is therefore necessary to listen to them often. We shall thus try to taste that nectar (i.e., the Gospel) which will deliver us from this ocean of birth and death. His grace permitting, if we can assimilate even some of its inner significance, our lives shall become blessed. And if by chance we somehow taste even a drop of that nectar, we shall become immortal. 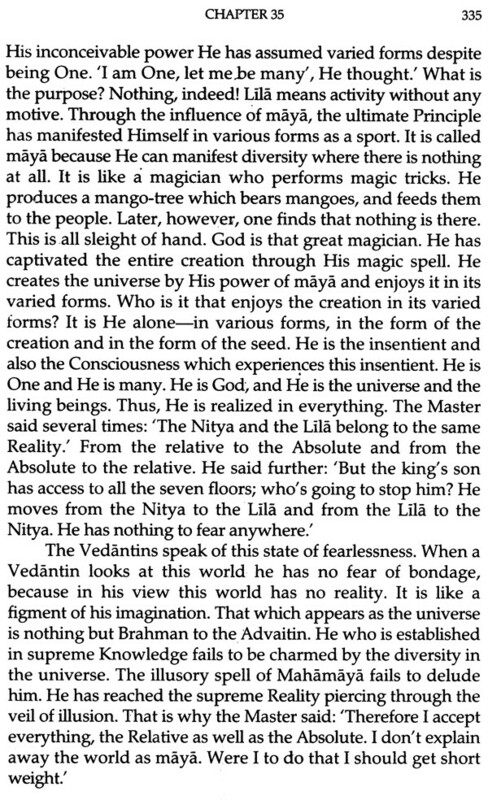 This is why the words of Sri Ramakrishna have been called nectar (amrita). M. could not find any other comparable expression; he named it Kathamrita (nectar-like words) keeping in mind the words of the Bhagavata. For ages to come people will drink this nectar and become immortal. This eternal message will reach every home, enter every human heart, and make everyone immortal. One does not need any special qualification to drink this nectar. The study of the scriptures presupposes the possession of special qualifications; a person has to attain some knowledge, which qualifies him or her to study the scriptures. To study the Gospel, however, one need not possess any special aptitude. A person who does not know anything may understand the Gospel more easily. Knowledge of many things confuses a person and increases doubts. Fundamentally, 'Knowledge of the One' is true knowledge. 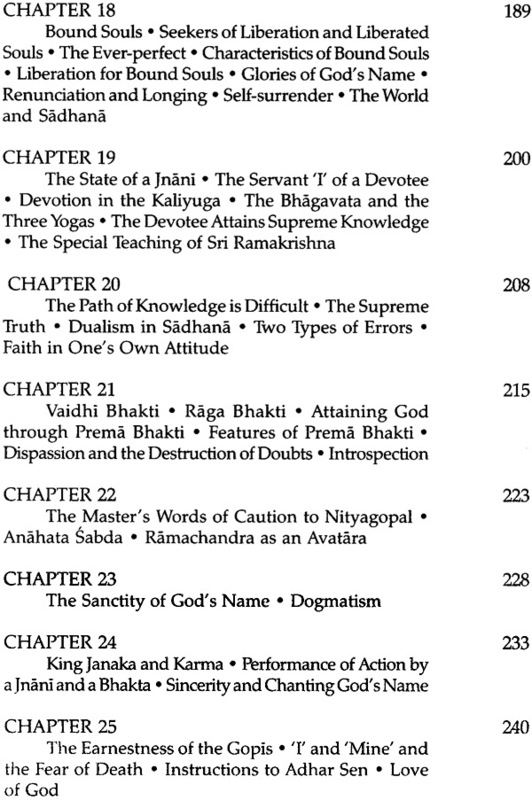 In his first visit to Sri Ramakrishna, M. learnt 'that to know God is knowledge and not to know Him is ignorance.' This is worth noting. 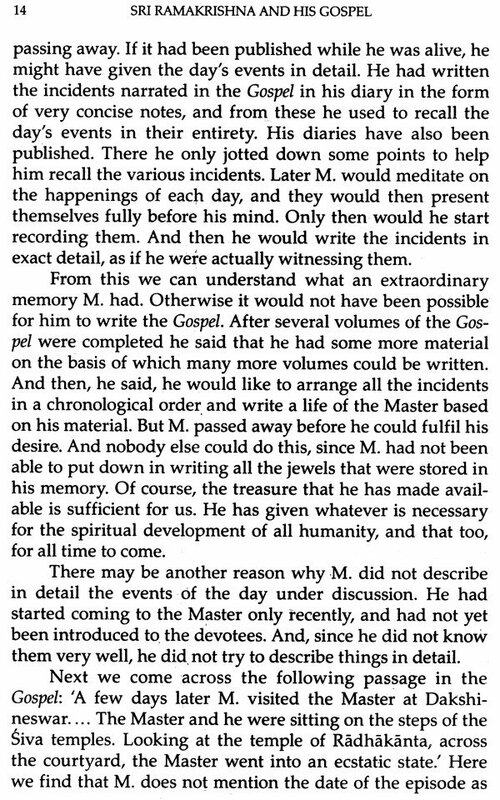 It was something new to M. He had gone to Sri Ramakrishna with a pure mind. For this reason the Master accepted him as his own from the very beginning. Quite unconscious of it himself, Sri Ramakrishna conferred on M. the special responsibility of the dissemination of his message throughout the world. When this saintly and learned M. went to the Master, the first issue that was raised made him realize that 'to know God is knowledge, and not to know Him is ignorance.' There is no doubt that our intellect gets a little refined when we read a few books. But if our mind is not purified, intellectual refinement will not help us much in realizing the Truth. 'Reading books makes one a parrot, not a pundit', as a popular Hindi couplet says. The Master said that a trained bird repeated 'Radha-Krishna' and so many other things. But 'when the cat pounces upon the bird, the bird only squawks and does not say, "Rama, Rama, Hare-Krishna".' Scholarship sharpens a person's intellect, makes a good orator of him, and equips him with the power to charm others by his talks. But it does not dispel his doubts. Learning alone does not lead a man to God. 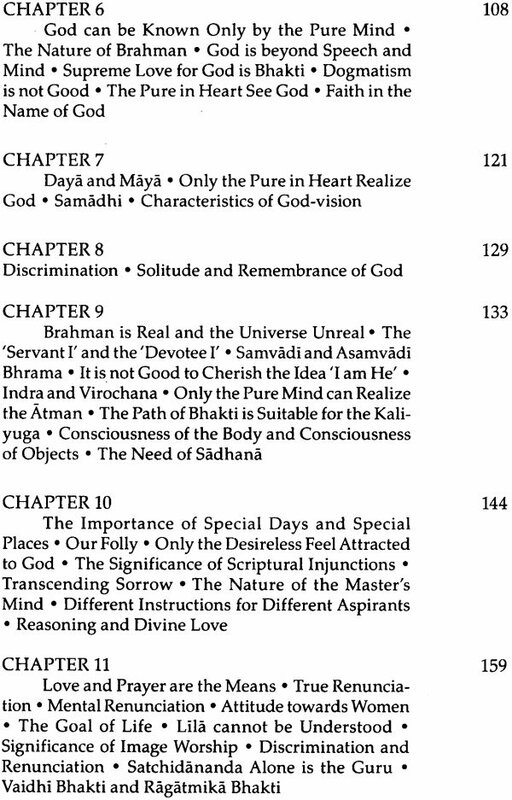 The path to God-realization is altogether different. No one can reach Him through scholarship. 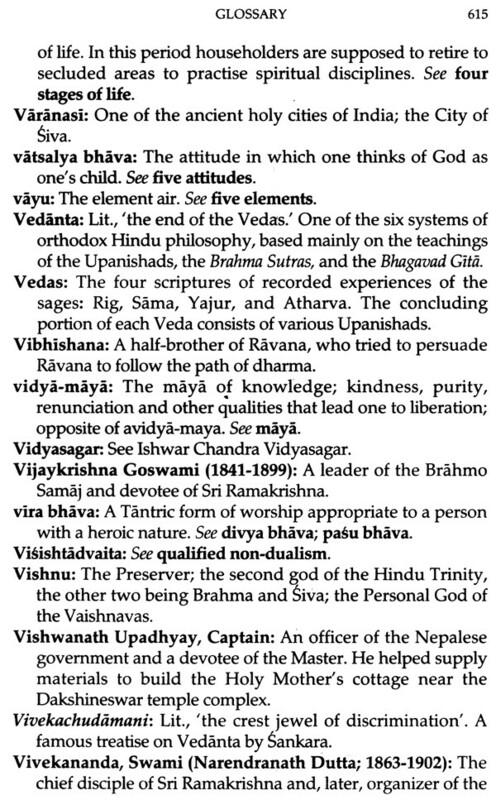 It is said in the Upanishad: 'The Atrnan is not attained through study/'' It is not that by acquiring knowledge of various scriptures one will necessarily become a bhakta or a jnani. On the contrary, too much study confuses one's understanding. It is said: 'Do not study many sastras as it tires out the speech organ." Excessive study disturbs the intellect. Study of the scriptures is necessary to purify the intellect, refine it, and to achieve concentration. But the scriptures themselves say that too much study distracts the intellect. 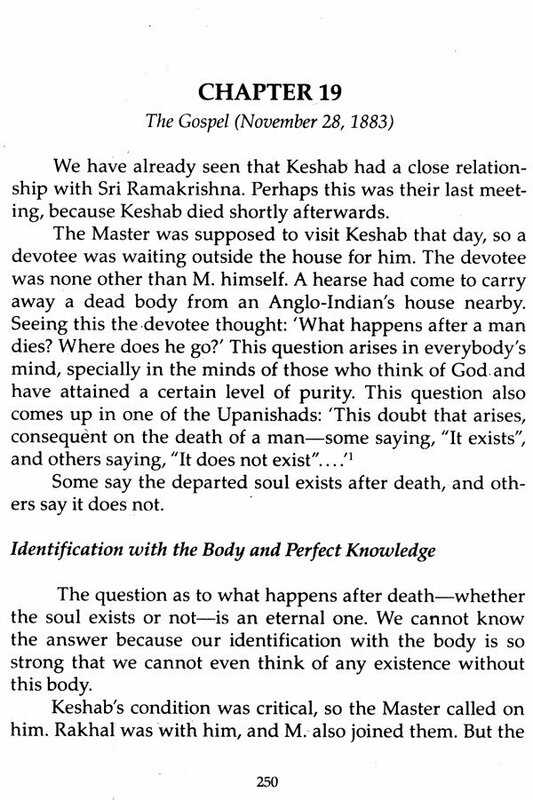 Sri Ramakrishna asked Vaikunthanath Sanyal one day: 'Have you read works like Panchadasit' Sanyal replied: 'What are they, Sir? I do not know.' Hearing his reply the Master said: 'Good that you have not. Some boys read those books and, giving themselves airs, come here; they will not practise anything, they simply come to argue. That is a torment to me.' By studying some books and suffering from intellectual indigestion one becomes a learned fool! A person thinks himself to be a great pundit, but actually he is a fool and worse, he does not know that he is a fool. It is for this reason that the scriptures say that one cannot know God through extensive study of the scriptures. 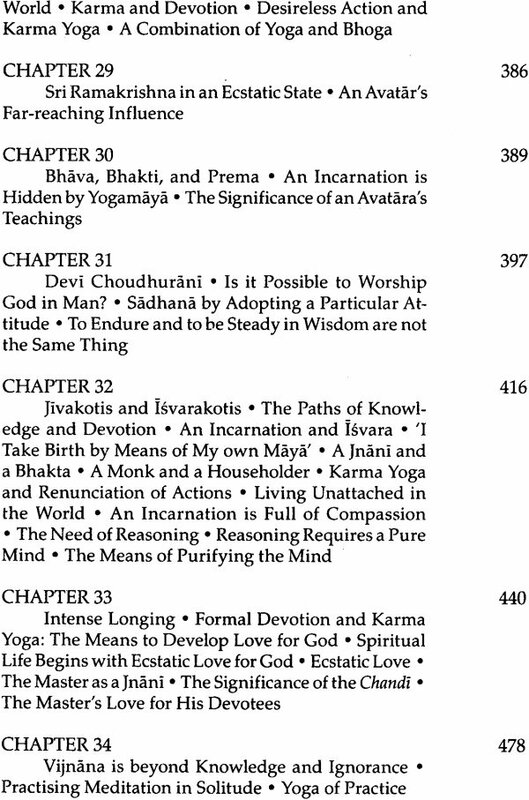 If there comes a little religious feeling one immediately starts reading such Vedantic works like the Gita, Panchadasi, etc. But what is the result? The result is unsettling of one's mind! Shall we not study the scriptures then? 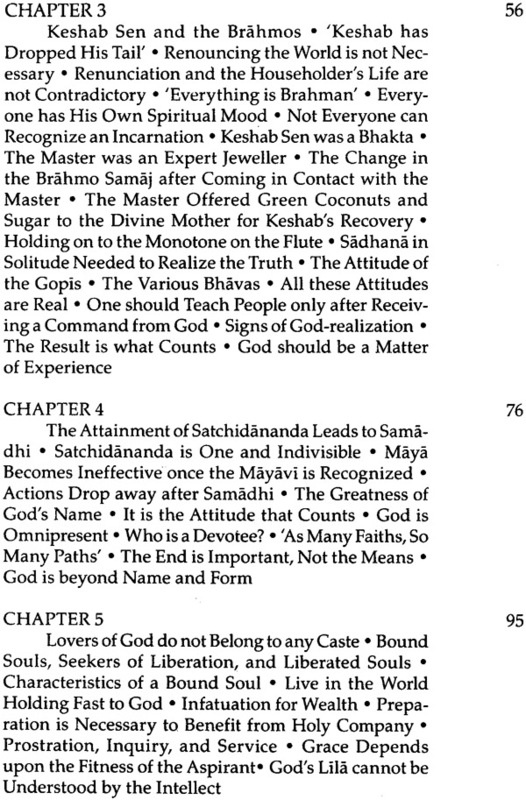 Neither Sri Ramakrishna nor the scriptures say this. We should study. But let us first acquire the necessary requisites like faith and discrimination, which are indispensable for such a study. We can easily understand the extent to which the scriptures can confuse people by seeing the endless schools of thought. Some say that the scriptures mean one thing, while others assert that they mean something else. Even today the disputes have not been resolved. The reason why there has been no solution is that everybody is fighting over the chaff. 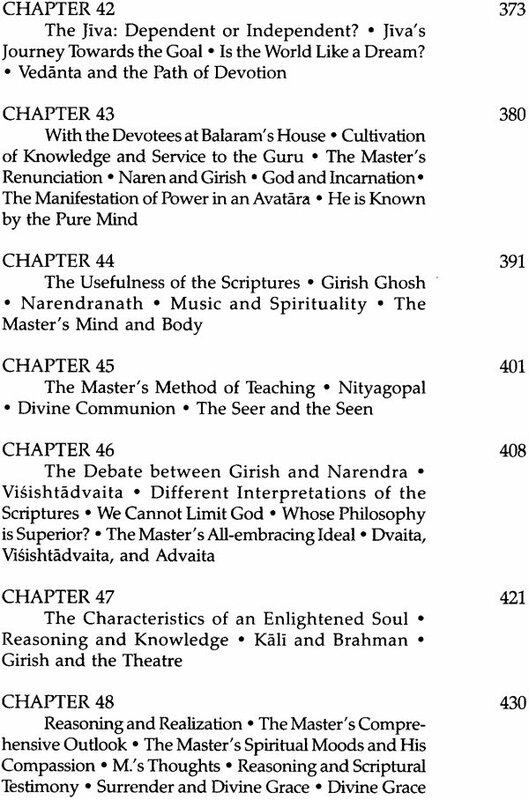 Nobody is able to reach the essence of the holy texts. 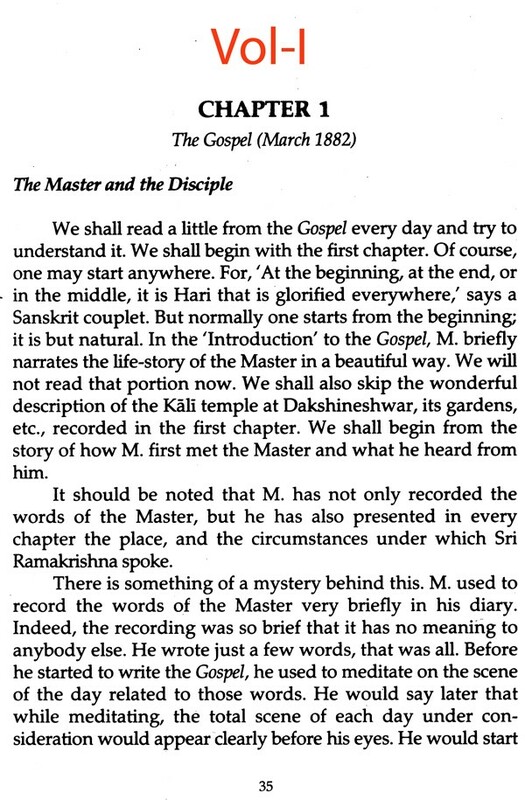 The Master said: 'The scriptures contain a mixture of sand and sugar, as it were. It is extremely difficult to separate the sugar from the sand.' That is why we are unable to understand the scriptures easily. Then what is the way out? The way out is to study the scriptures in the light of the lives of those who have manifested the truth in their own lives. Otherwise we cannot understand the holy scriptures. If we try to comprehend the scriptures independently, using our own intellect, it is quite impossible for us to grasp their essence. This is because we get entangled in the multiplicity of words and remain confused. It is just like many Western scholars who, in their efforts to decipher the meaning of the scriptures, used abstruse language and actually created limitless confusion. This is but natural, because their minds, the instrument with which they tried to understand the holy texts, were not purified. Therefore, the true significance of the holy texts could never be revealed to those minds. So, the only way left is to understand the scriptures in the light of those who have lived the spiritual truths and in turn imparted life to the scriptures after much sacrifice. There is no other way. From this point of view the Gospel will be an infallible guide to us. Through no other source can we understand truths so easily as we can through this. We doubt whether we can ever find such appropriate and easy solutions anywhere else to all the problems humanity has been facing since the beginning of the world. The Master used to say that the coins that were current during the reign of certain kings were not valid during that of others. He further said that: 'Suppose a man is laid up with fever. If you attempt a slow cure with the old-fashioned indigenous remedies, he will soon die. He can't stand much delay. Nowadays the drastic "D. Cupta" (a patent fever medicine containing a strong dose of quinine) mixture is appropriate.' The message is this: Old methods cannot solve modern problems. Times have changed. Many problems have come up which were not there earlier. Some new remedies are needed to solve these new problems. 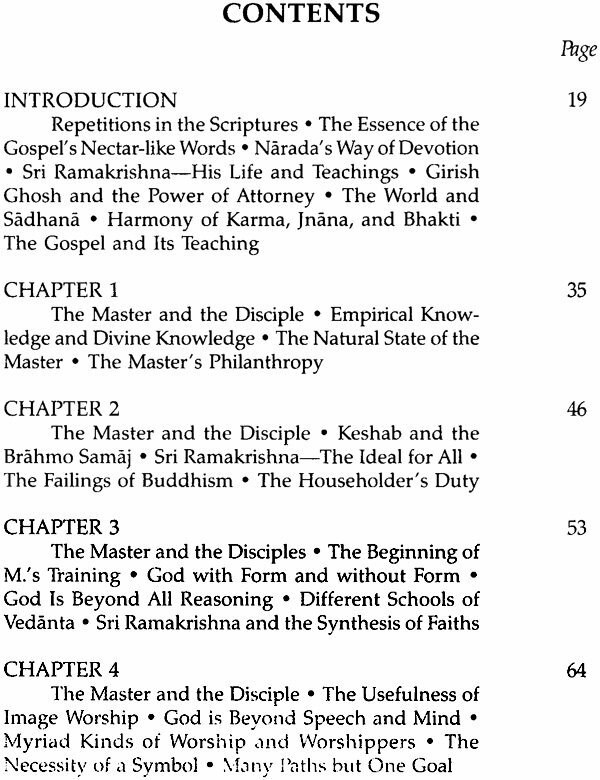 In the life of Sri Ramakrishna and in the Gospel we find unique solutions to these new problems. It is surprising to see the diverse remedies the Master has given to solve the problems we face in our lives. He said that in the past people used to perform various rituals and austerities. 'Now in the Kali-yuga the human mind is weak and people are dependent on food. So to cure the malady of worldliness the chanting of God's name with concentration is enough.' He further said: 'Where do you have the time to perform austerities like the rishis of the ancient days did? Your life is short and dependent on food. You don't have the time. Neither is it necessary for you to undertake the ostentatious rituals.' But he did tell us other things we should do. He speaks about Narada's way of devotion. 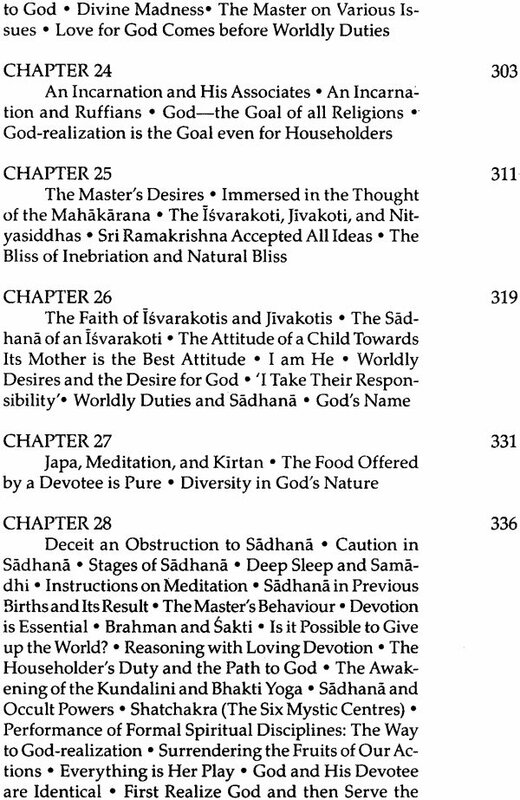 This devotional path is not exclusive to any particular sect. The essence of Narada's way of devotion is that it is pure, implicit faith in God which makes a devotee take refuge and totally surrender himself to God. He even showed us how to pray for it: 'Mother! I do not know anything. Teach me everything. Give me proper understanding. I do not know how to reach you. Please make me do what I should do.' This kind of total surrender is Narada's way of divine love. The idea is; one wants nothing from Him but Him alone. Here God is perceived not as a means to some end. We do not seek Him to cure our ailments, to increase our wealth, to keep our relations happy and grant them long life-these are not the aims. These are natural desires of the human mind. 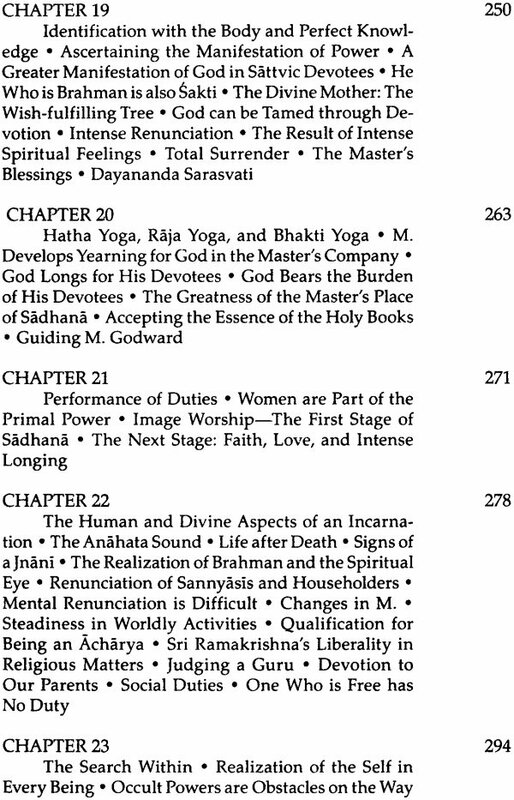 But Sri Ramakrishna forbade us from praying to God for the fulfilment of these worldly desires. Why? The Master said: 'Does anybody approach the King for pumpkin, gourd, etc.? God can give that. It is not that He is incapable of giving these things. But He can give many other things. He is the Wish-fulfilling Tree. If we can get anything that we ask, why settle for insignificant things? Why not ask Him for Himself? If we once get Him, nothing else remains to be had!' 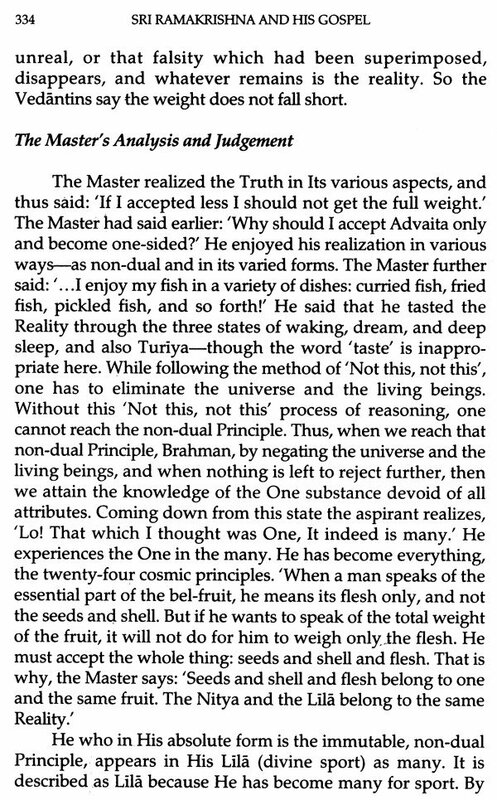 'Obtaining which one does not think of any other acquisition to be superior to that', says the Gita. It is stated in the story of Dhruva that, mortified by the abuses and insults of his stepmother, Dhruva set out for tapasya at his mother's bidding. He wanted to acquire a kingdom bigger than that of his father. This is the way children think. He had been insulted, so he wanted a larger kingdom than his father's. He began praying to God with unwavering concentration. God had to respond to the sincere, intense prayer of the child. Appearing before Dhruva, He asked, 'Tell me, what boon do you want?' Dhruva was in a dilemma and said: 'Boon! I do not want a boon.' 'How is it? Think again. Perhaps you wanted something which made you perform tapasya.' Then Dhruva remembered: 'Well, yes. I was seeking a huge kingdom. 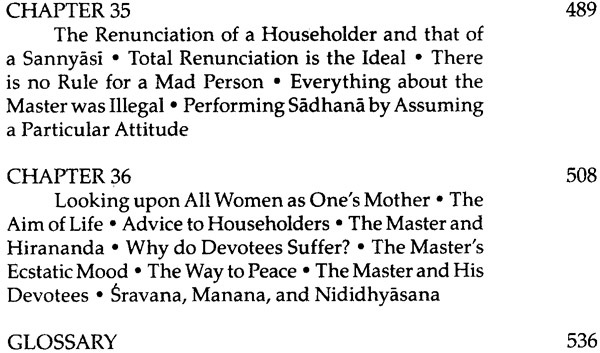 This is why I started my tapasya. But I have since acquired a thing of far greater value than what I wanted. I set out in search of glass pieces, but have got gold. A valuable thing indeed! I do not need your boon any longer. O my Lord, I have attained fulfilment. I do not want your boon!' This is called unconditional devotion, selfless devotion, Narada's way of devotion. This type of devotion suits people belonging to any sect of Hinduism. Not only Hindus, the followers of other faiths can also practise it. Without having this type of devotion, one cannot enter the spiritual world. We find this simple advice time and again in the Gospel. More than anything else, we should observe the life of Sri Ramakrishna. All his teachings are enlivened by his life. His words are not mere words; they are all reflected in his life. His life stands as a testimony to what he preached. Hence we shall easily understand the Gospel if we direct our attention towards his life. He appeared solely for this purpose in this age of uncertainty and unrighteousness. Admirers of Sri Rama- krishna bear the conviction that with his birth the millennium (Satya-yuga) has begun. Swami Vivekananda also used to say so. We are born at the beginning of this Golden Age, or Satya- yuga. It is not an insignificant thing! 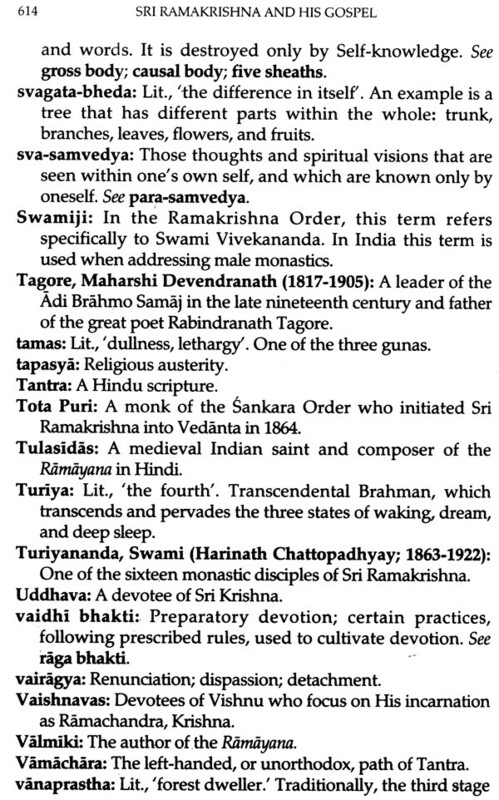 We have been born in an age when the radiant influence of Sri Ramakrishna is spreading far and wide in all directions. We are face to face, as it were, with a condensed form of a vast mass of energy. It is as if we have stationed ourselves beside the Sun. However, this Sun does not burn; it soothes. There is nothing frightening in Sri Ramakrishna. We shall not find anything to be afraid of when we read his life. Even a small child does not feel scared of him. He has no matted hair, no ashes smeared on his body, no awful paraphernalia, nor does he raise terrifying sounds.